This card was given to me by someone who had found it in a wall of his house. 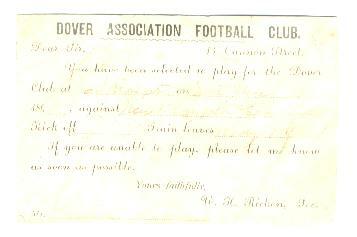 It is dated 1898, and it tells a player that he has been selected to play in the away fixture against New Brompton Excelsior. The ink is very faded and difficult to read, but I can make out that much. On closer inspection, I think the date is the 26th.March. 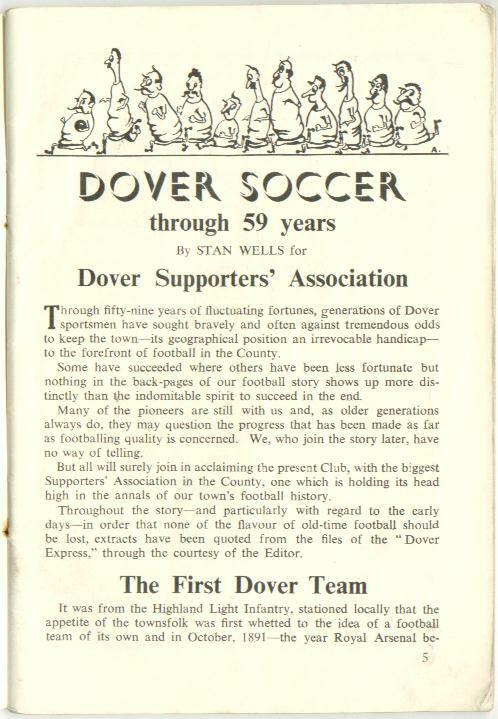 However, it seems all games were postponed that day, and the away match at New Brompton was never played. 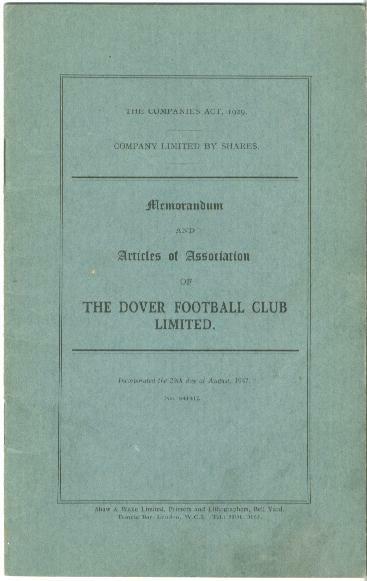 This booklet was given to shareholders of the Club. It lists all the rules and regulations concering the running of the limited company. One clause that we found interesting was the one that stated that a director could be disqualified from office should he be, 'lunatic or of unsound mind'. Now, as far as we know, this was never done, despite some obvious candidates! A sad tale, indeed. A poor student, struggling to make ends meet, invested 5 pounds of his beer money (Sorry, grant!) in D.F.C., only to have this piece of paper rendered absolutely worthless five years later. 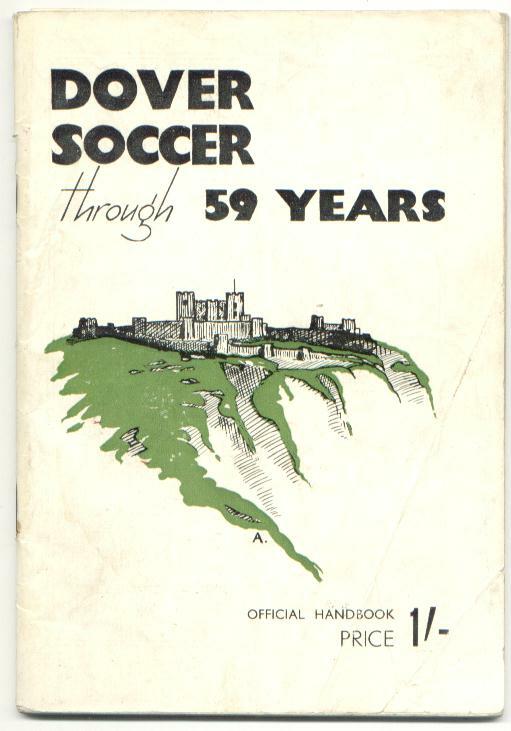 The front cover and first two pages of the booklet produced in 1950. 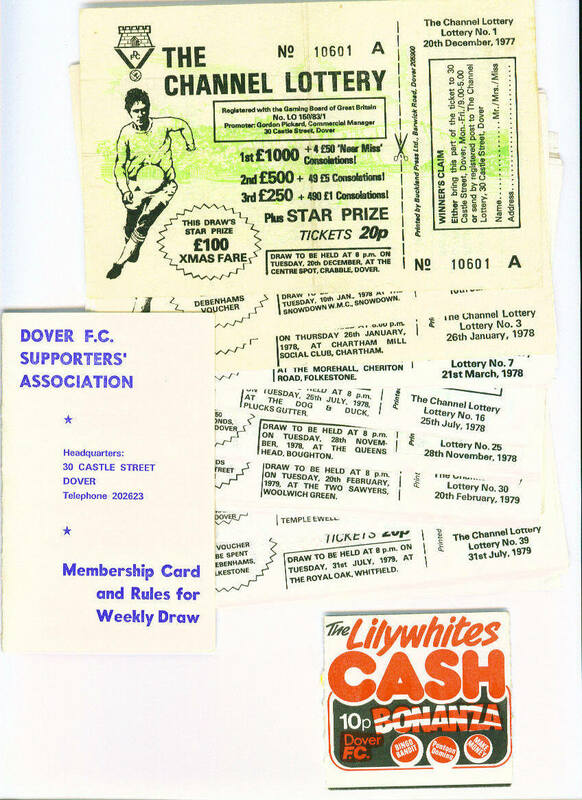 Dover F.C. 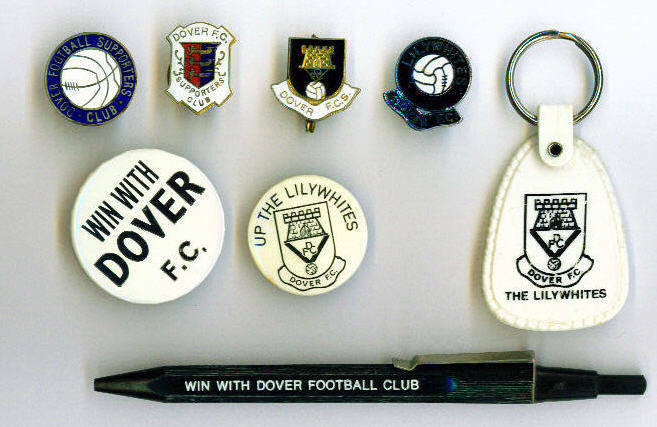 memorabilia: four metal lapel badges, two button badges, a pen, and a key-fob. I do have another button badge, but it went through the washing machine, and is now plain black! 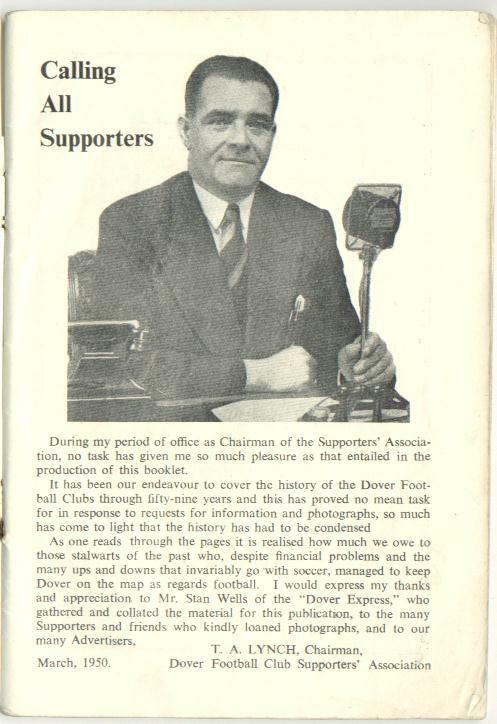 The Channel Lottery, with its promotion team - "The Dover Darlin's" - remember them?, brought in much-needed financial support for the Club, but in the end, it just wasn't enough. Also pictured, a Tote membership card, and a bingo ticket. All are from the 1970s/early 1980s. 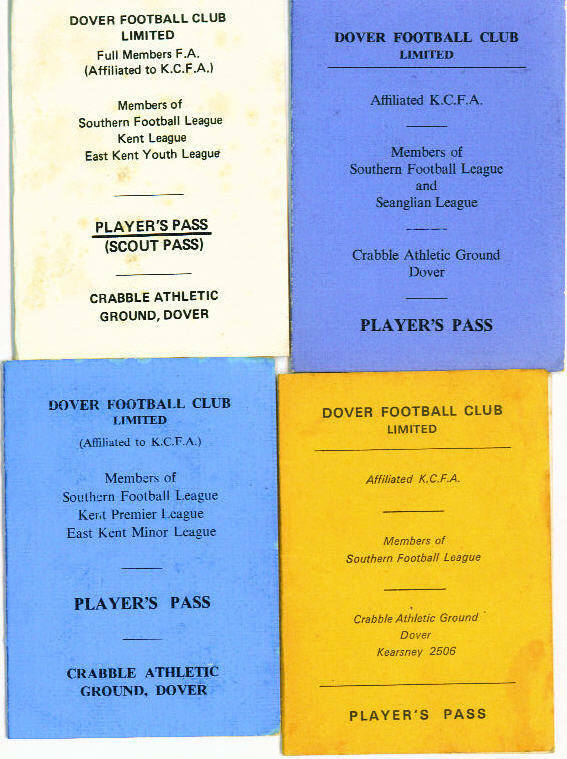 Four players' passes. 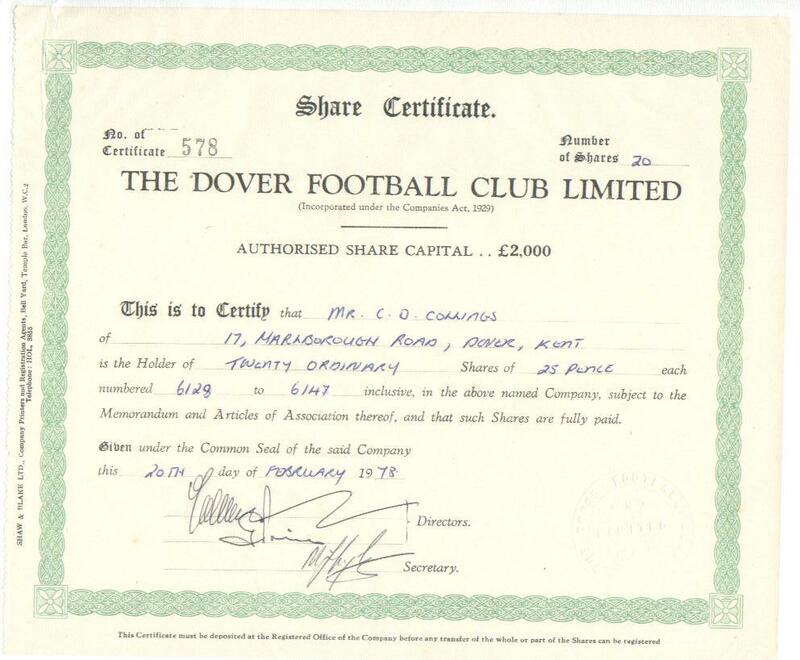 Inside is the manager's name and address and 'phone number, and the 'phone numbers of the Club office and ground. The managers are: top left - Tommy Coulter, top right - Pat Beasley, bottom left - Jack Clover, bottom right - Terry Adlington. 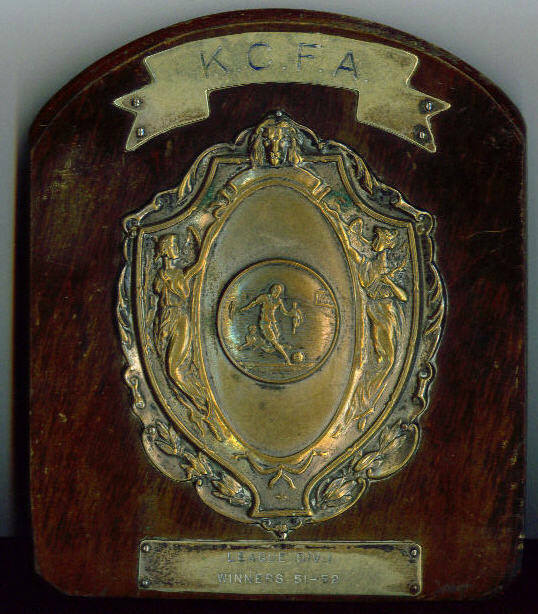 Dover won the Kent League that year, and I would imagine that each of our players received one of these trophies.